The aperture diffraction pattern above was photographed with Fuji Sensia 100ASA slide film and then digitized. With the time exposure necessary to show the side lobes, the central peak was washed out nearly white. The only retouching of the digital image was to paint in the washed out part of the central maximum (Airy's disc). The pinhole was made by placing aluminum foil on a glass plate, sticking a straight pin into the aluminum foil, and then rotating the foil. Several pinholes were made, and this one was the closest to being round. The active formula above can be used to calculate displacement y, wavelength, or aperture diameter by clicking on those quantities. You should enter the known data first, then click on the desired quantity. The entered data will not be forced to be consistent until you click on a quantity to calculate. 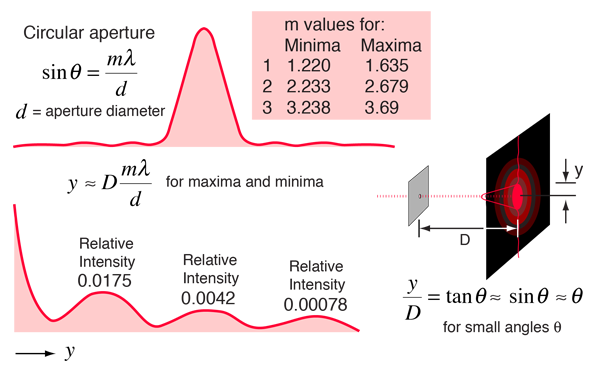 Calculation of the displacement y will calculate the positions of all maxima and minima in the table below. Any quantity in that table can be changed for the purpose of calculating the other parameters. The active formula above is written as the small angle approximation, but the calculation makes use of the full trigonometric relationship. This yields the following pattern of maxima and minima in the diffracted intensity.